Brilliant ruby colour with purple tints. Quite pronounced, very fruity aroma with impressions of red fruit cherries and violets. Medium bodied, quite mild and soft though dry. Fresh and slightly spicy aftertaste with an elegant bitter note of bitter almonds. Lagdo di Caldaro is usually drunk in the year after production, but can laso be cellared for at least 3 years. The garnet red color holds promise of strong aromas and opulence: Growing in the warm soils of Bozen's circular valley, its fruity and zesty bouquet is reminiscent of chocolate, ripe cherry and violets. The long maturation favors the Lagrein's soft tannins and a pleasant freshness, followed by an impressive finish. A wine of choice with game, game birds and stewed dishes. Medium cherry-red colour. Pronounced, fruity (prune, cherry) and spicy aroma with notes of leather, tar, dark chocolate and floral nuances (violets), along with oak spice. Medium structure and with good fruit intensity on the palate. The tannins are present though balanced. Good length with an earthy aftertaste. Our Pinot Nero is produced entirely grapes produced French clones. The fermentation is spontaneous in open wooden vats, while malolactic fermentation takes place in barriques. The wine is then refined for twelve months in French durmast oak casks. Kalterer See Classic Superior - 2017 - winery Termeno 10,50 EUR / 14,00 €/lt. Pinot Nero South Tyrol - 2018 - Winery Kurtatsch 13,75 EUR / 18,33 €/lt. 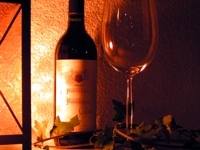 Merlot Passion HK - 2011 - vine cellar St. Pauls 37,10 EUR / 49,47 €/lt. Merlot Riserva Siebeneich HB 0,375 lt. - 2016 - wine cellar Colterenzio 12,75 EUR / 34,00 €/lt. Lagrein South Tyrol - 2017 - Winery Egger-Ramer 13,45 EUR / 17,93 €/lt. Schiava Missianer - 2017 - vine cellar St. Pauls 9,85 EUR / 13,13 €/lt. Both were very good and what I had in Austria some years ago ..